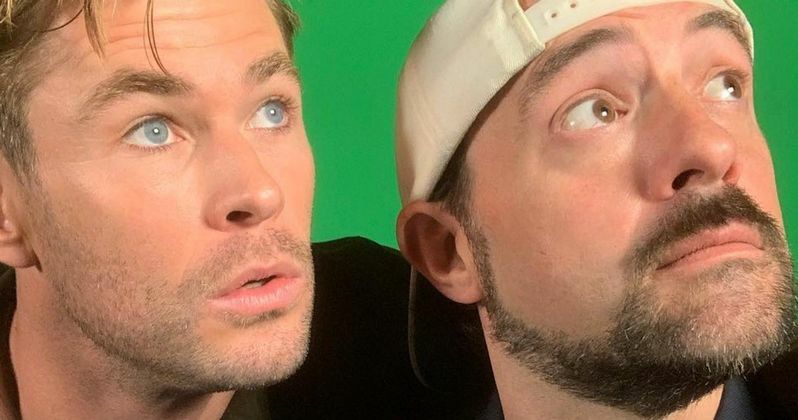 Kevin Smith has announced Avengers: Endgame star Chris Hemsworth has a cameo in Jay & Silent Bob Reboot. Smith recently wrapped production, but he isn't finished announcing all of the celebrity cameos we'll see when the movie debuts. Hemsworth is best-known for playing Thor in the Marvel Cinematic Universe, but that's all about to change with Men in Black: International and other movies the diverse actor has coming out in the future. Who knows, maybe Jay & Silent Bob Reboot will introduce him to a new audience. Chris Hemsworth has a mystery role in Jay & Silent Bob Reboot. Kevin Smith made the announcement over the weekend on social media and pretended the world doesn't know who the actor is, which probably means his God of Thunder status might be teased in the upcoming movie. Smith posted a picture of himself and Hemsworth with a pretty lengthy caption, which you can read below. "Sometimes I like to highlight unknown actors in our industry - and I think *this* fresh face from young Hollywood might soon find fame and fortune on the Silver Screen! He's newcomer Chris Hemsworth and I'm predicting right here that Chris is gonna take Tinsel Town by storm one day! The boy is like a god who thundered down from another universe! But it's not some kinda dark world because this guy is no black hat - he's an artistic avenger who's just looking to book his first gig on the way to his ultimate endgame: a S.A.G. card! So I'm gonna take a chance on this up and coming charismatic kid from Australia and help him out on his star trek with a low key role in Jay & Silent Bob Reboot. He's a killer comedic actor but I keep telling him that the *real* money's in Marvel Studios movies. In a just world, he'd get to at least screen test for them. Regardless, I'll keep you posted on Chris' Hollywood progress. He should go far, because Chris is a super nice charmer who's crazy talented and incredibly generous with his time. If you can get past the guy's unorthodox looks, you'll find a whole Hems worth of raw, untapped talent!" Kevin Smith is obviously messing around and is pretty excited to have Chris Hemsworth on board for Jay & Silent Bob Reboot. As for a scene where he could be good in, one would imagine a meeting with Jason Lee's Brody Bruce would be pretty hilarious. Hemsworth could take on the Stan Lee role from Mallrats where Bruce asks him wildly inappropriate questions about the Marvel Cinematic Universe and the superheroes. Now that production has wrapped on Jay & Silent Bob Reboot, the wait is on for the first footage. Kevin Smith will more than likely debut the star-studded first trailer at San Diego Comic-Con this year with a few teases before then. As for the release date, there isn't one set, but the director/writer was originally aiming to have it out by this fall. Kevin Smith hasn't spoken about the release date of Jay & Silent Bob Reboot in a while, so we might be looking at an early 2020 release date instead. We'll just have to wait and see if he announces anything in the coming weeks. Smith has been really good with keeping fans up to date with anything having to do with Reboot, so one would imagine he'll be pretty excited to announce the official release date when the time comes. For now, you can check out the Chris Hemsworth introduction below, thanks to Kevin Smith's Instagram account.